I started with some chipboard and my SU! Top Note Die. I then used the papers from the Father's Day Key Ingredients to cover the front and back of the die cut. The image was stamped with Memento Black onto some kraft cardstock and coloured with Copic markers. The golf ball was coloured with a white gel pen. I then used the Oval Nesties to cut out my image and sentiment layers. A jumbo eyelet was used so that I'll be able to attach the tag to a golf bag. 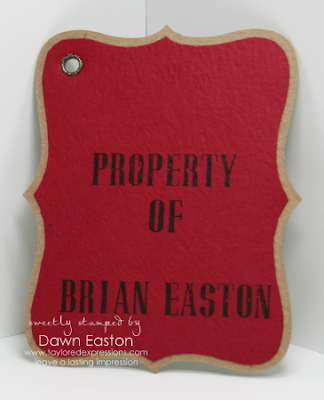 The back was stamped using the JustRite Brayton Font and the Harmony Rectangular Stamper Set. Here is one I made for myself. PINK of course! 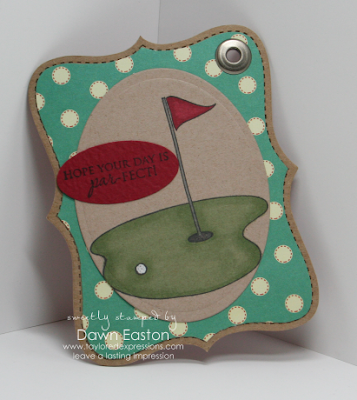 I've used the April 20th Key Ingredients designer paper to cover my chipboard top note die. The backside is stamped just like my husband's but with my name ;) Since I like ribbon I decided to add a little bit to mine! Don't want to miss any fun projects by the Baker's Dozen? Be sure to sign up for the Taylored Expression Newsletter!!! You'll find the sign up on the right side bar. Such a cool Idea Dawn!!! love it!! Oh my gosh, you DID make one for yourself too! I love that you used that pink/red paper from the KI subscription kit for yours...VERY sweet and girly! The coloring of the green on kraft looks fantastic! FANTASTIC job on the tags, my friend! I always love seeing what you do with the top note die. ADORABLE, Dawn! I love them both! What a great idea! 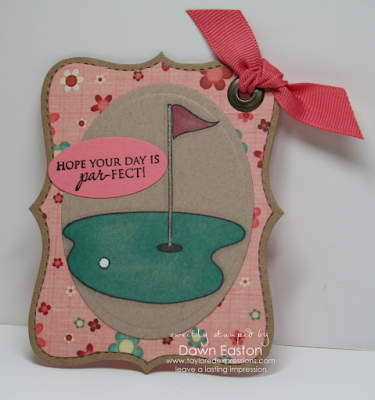 I should totally make one of these for my sons golf bag....hmmm...thanks for the idea! What a great card, love that shape. Fabulous idea Dawn! I'll have to case these for our golf bags.